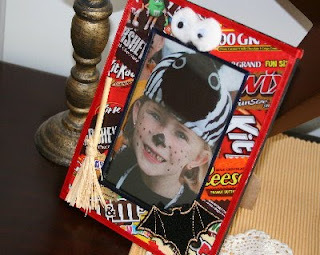 You'll need a picture frame with a flat surface, decoupage and an applicator (I used a sponge brush,) a collection of clean candy wrappers and a pair of scissors, and optionally a small file. 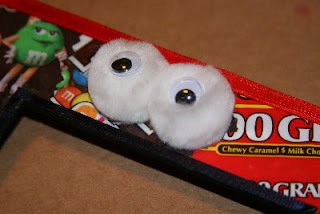 In addition, gather whatever small embellishments you might have leftover from your decorations or treat bags. Because of the drying time needed for the decoupage, this project will take several short sittings. 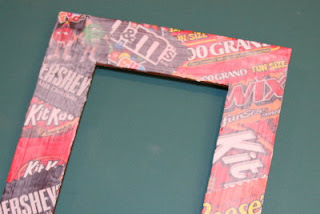 Apply a generous layer of decoupage to the surface of the frame. 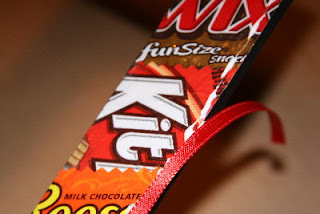 Open the candy wrappers flat and trim as needed. 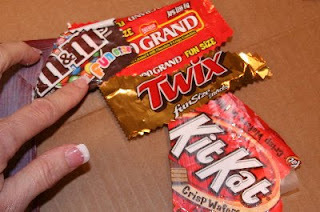 Place the candy wrappers unto the decoupage. Repeat the process all the way around the frame. 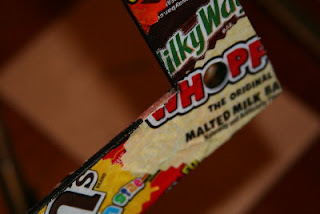 Once all the wrappers are placed, apply another layer of decoupage over the top. 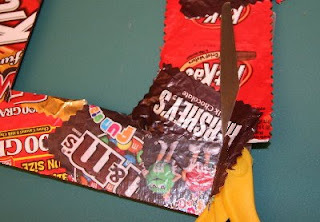 I learned with this project that candy wrappers are not like paper -- they don't absorb the decoupage, plus they have a little fight in them. 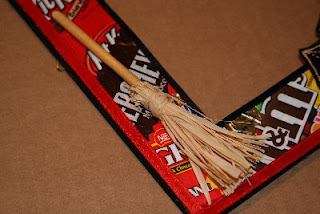 So originally I had hoped to wrap the candy wrappers around the sides of the frame, but I wasn't able to get a good corner to the edge, plus the wrappers tended to peel back up. You might have more experience or better luck, but I was content with the front being covered. 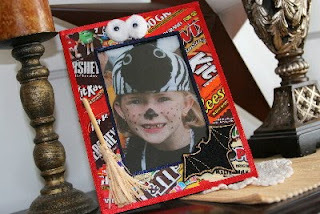 Once the decoupage is dry, use a scissors to trim the candy wrappers up to the edge of the frame. Apply another layer of decoupage. 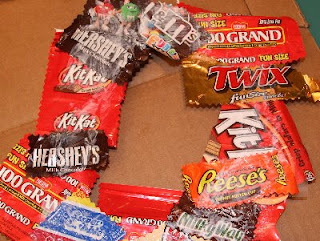 I found that it wasn't necessary to lay the frame upside-down again, since all the wrappers were tacked down. 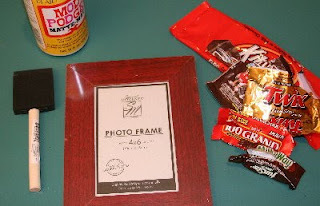 After finishing with the decoupage, I decided I didn't like the color of my frame showing around the edges, since I wasn't able to turn the wrappers around the edges. I used a small brush and carefully applied a coat of paint to the edges. With the wrappers I used, paint washed right off any unintentional spots. Next, I took a file and sanded the edge of the decoupage to remove any rough spots from the scissors. 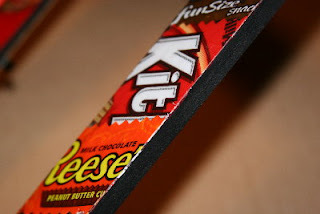 I still wasn't happy with the finished edges, so I decided to add a little ribbon to soften the edge. 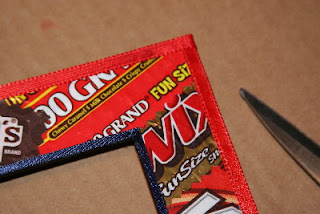 I used tacky glue and ran a thin line along the edge, then placed the ribbon and trimmed the ends. I'm a real fan of hot glue, but in this case, the white glue lets you adjust the alignment of the ribbon before it sets. And there's nothing worse in crafting than messing up a project when you're almost finished. I also added ribbon to the inside edge. 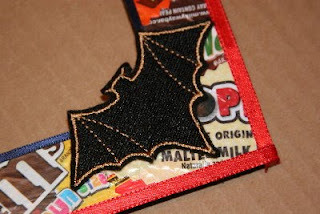 I found an embroidered bat that I had left over from the badges I made for my son's boyscout caving expedition. 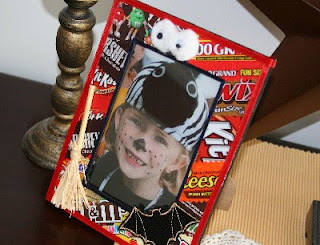 Now, just include a picture of your little boo or ghoul and you're finished!. I think what I like most about this project (well, besides eating the candy, of course) is how the frame is almost like a trophy for a "Super Candy Achievement Award," complete with a portrait in full team uniform.